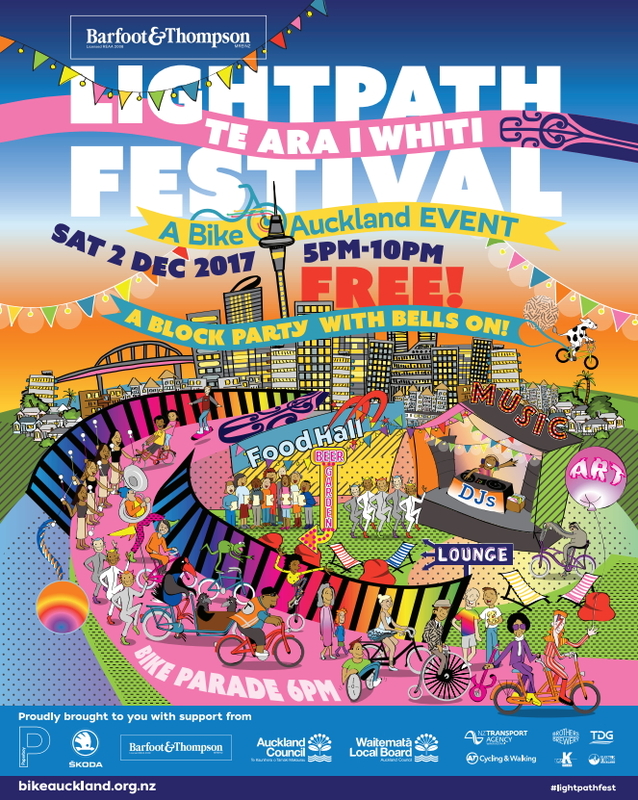 With Auckland’s beloved pink path Te Ara i Whiti turning two, it’s time for a block party with bells on! Hosted by Bike Auckland, the non-profit organisation working for a better city for people on bikes, the inaugural Barfoot & Thompson Lightpath Festival is a free community celebration that invites the public to enjoy the city’s public spaces in a playful new way. On Saturday 2 December, from 5:00pm-10:00pm along Lightpath/Te Ara i Whiti and Canada St (just off K Road), an anticipated crowd of over 10,000 will experience the city by night in traffic-free spaces brought to life with roving entertainers, live music, art, food and festivity. Festival-goers are warmly encouraged to arrive and explore on foot and by wheels, to maximise the fun. For Lightpath Festival, Canada St will become a pop-up piazza: a convivial place to eat, drink, play, and hang out under the stars, with music from the main stage by K Road DJ collective, The Grow Room. The Mercury Plaza car park will be transformed into an open-air dining room, with delicious Asian cuisine from Mercury Plaza’s 12 food vendors, and sweet treats from local dessert and coffee makers. And the Electric Bicycle Hub’s parking lot will turn into a cosy space where festival-goers can sample craft brew beers from the Brothers Beer Garden, or chill out in the Barfoot & Thompson Lounge. At 6:00pm, all are welcome to join the festival parade, starting at Lightpath’s Canada St entrance and launched with a rousing waiata from the Auckland Street Choir. Paraders will roll along the pink path accompanied by the irresistible New Orleans-style jazz of the Auckland City Scoundrels, culminating in sweet treats, selfies and song with the Caluzzi candyfloss drag queens. All evening long, Lightpath and Canada St will sparkle with artful surprises to discover, including teeny tiny bikes, the Funky Space Cats, trick cycling, the Real Pyramid Schemer, and stunning interactive installations – like Poi Magic by Mei Hill, Tania Remana, Olivia Haddon and Angus Muir – while those with wheels can try zigzagging through the slalom obstacle course or grinding along Def Store’s skateboard rail. More programme highlights to come; follow Bike Auckland on social media for updates. And, with the new extension of the Nelson St protected cycleway in late November, people arriving on bikes will be able to safely access Lightpath Festival by travelling up Nelson St from the Viaduct, or via the Grafton Gully Cycleway, as well as from the Northwestern Cycleway via Upper Queen St. This festival is the first of a planned annual series, and is hosted by Bike Auckland, with sponsorship and support from Barfoot & Thompson, Paperboy, Auckland Council, Waitematā Local Board, Auckland Transport Walking and Cycling, NZ Transport Agency, SKODA New Zealand, K Road Business Association, Traffic Design Group, Brothers Beer, Electric Bicycle Hub and Mercury Plaza. Look’s outstanding and a credit to all those involved. Let’s hope it is a great success!